BOND: Revisiting THE LIVING DAYLIGHTS | Warped Factor - Words in the Key of Geek. With the announcement that Roger Moore was leaving, many fans of the already quarter-century old Bond film series were left to wonder what was next. With over twelve years of comedic 007 adventures climaxing with (in this writer's onion) the worst film in the series, opinions among many fans were for a return to the more serious films along the lines of the early Connery era. 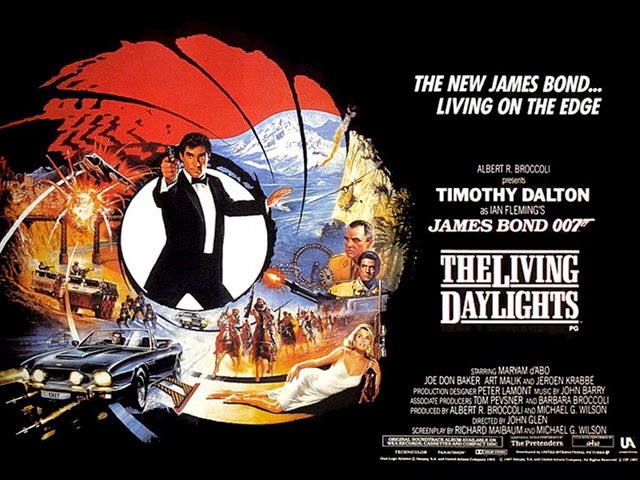 The hopes of fans were realized with The Living Daylights, a film that began a new era in the world of 007. The change begins with the actor playing James Bond: Timothy Dalton. Dalton is perhaps the closest actor in terms of vision to Ian Fleming's idea of Bond. He certainly looks the part, with his scalp of wild black hair and his piercing blue eyes, and one can actually visualize him as a secret agent with his agile and strong form. Not only that, he also has the acting chops. Dalton's Shakespearean and stage training come into use perfectly here. Just look at the scene where Bond is at the fair, having lost Saunders's murderer amongst the crowd and found the balloon with Smyert Spionam scrawled over them. The eyes say everything. Dalton relies more and more on his acting ability, and not jokes and gadgets, to pull the character through the film. Despite this being his first movie as Bond, we get the feeling that he's been playing the part for years with his mastering of the character. Gone are the bad jokes of Moore and in is the seriousness and the occasional intelligent humor. This is how Bond should be: serious, intelligent, and with equally intelligent jokes. Dalton is also great in the action sequences and his belief that he should do as many of his stunts as possible makes it hard to determine when it’s him and when it’s a stuntman. He can also throw a good punch and, unlike Moore, looks like he knows what he's doing. The change continues on with the Bond girl Kara Milovy. After the worst Bond girl of the series just one film earlier this girl is a 180-degree turn around. Maryam d'Abo may not have had a lot of acting experience before this but she is a good actress, more than capable of banishing the memory of Tanya Roberts in A View To A Kill. In large part, that's because her character goes far beyond being just eye candy. She's an average woman, an innocent brought into it all by a man she cares for deeply and whom she owes everything to, who is drawn into this world of intrigue and danger. Bond isn't just a dominating figure who must seduce her, as in From Russia With Love, he's the man who has brought her to a point where she is free to show off her talent for the entire world to see. Her gradual relationship with Bond that slides a scale from ally to mistrust to romance also gives us one of the series few true romances, something even more rare once the series moved past the 1960s. If the film has a fault in it, it would have to be the villains. While both Jeroen Krabbe and Joe Don Baker are good actors, this isn't their shining moment. Both of the characters of General Georgi Koskov and Brad Whitaker are too un-villain like to be bad guys. Any menace that Koskov might have had is ruined by the fact that he is constantly kissing everyone on the cheek. Brad Whitaker is almost too weird to be a serious villain, as he ranges from the ultimate military historian to the craziest. At least unlike Koskov, he does have a great final showdown with Bond during the fantastic gun battle at the films end. The supporting cast is also excellent. Andreas Wisniewski is wonderfully menacing as Necros despite being an obvious take on Red Grant, in From Russia With Love, he manages to be original. John Rhys-Davies and Art Malik are fantastic as the allies of the film. Both actors are initially suspicious to us, but when they are revealed as allies they are the ones we want on Bond's side. Too bad we didn't see more of them. And let's not forget Thomas Wheatley as Saunders. He is the ultimate bureaucratic agent, but he can get the job done and he's so good that when he becomes the film's sacrificial lamb we feel for his loss. As for Caroline Bliss and John Terry it is hard to find good things to say, both were replacements for well-known and beloved characters in the series and it wasn't going to be easy. Here they failed. Neither has enough screen time to establish them in the parts and when we do see them they are lousy at best. We do have good performances from M, Q, and, for the last time, Gray and they help to add a sense of continuity to the film. The film's storyline and action is top notch. After years of outrageous plots and action sequences, there is a strong sense of realism restored here. The plot is one of the series best, painting a portrait of the world towards the end of the Cold War even as East and West still vied with one another. True it is very complicated and at times hard to follow as it draws in elements ranging from Cold War defectors to diamonds and opium, but it's something rewarding for viewers there to pay attention. Substance triumphs over style here and, after so much of the Moore era, it's a breath of fresh air. Which isn't to say the film is lacking in action, far from it as the action sequences here are among the best in the series. The film’s teaser featuring the training exercise and later chase on Gibraltar is the best the series had presented in a decade. The Aston Martin car chase is not only the best car chase since For Your Eyes Only but also the triumphant return of the classic Aston Martin. While the car has gadgets they are at least believable, and the chase features the classic scene of the police car being split in half and Bond and Kara escaping over the border in the cello case. Other great action scenes include the roof top chase in Morocco, the battle at the Afghan airbase, and the gun battle between Bond and Whitaker. But the movies best action sequence is the cargo net fight at the film’s end. The excellent editing together of the aerial footage and footage shot in the studio puts together the best fight sequence since the beach fight in On Her Majesty's Secret Service. Despite the ton of action, the film’s plot never suffers and makes this one of the best-paced Bond films. There is also the matter of John Barry’s score, which sadly turned out to be Barry’s final Bond movie, also to be amongst his best work since Diamonds Are Forever. It is largely action based, making excellent use of the main title theme song, the song Where Has Everybody Gone?, and the James Bond Theme taking a heavy synthesizer feel. The score feels both modern and yet echoes the classic scores that Barry had made a staple of the series. But perhaps the films best is the romantic music used in the scenes between Bond and Kara, based on the song “If There Was a Man” it is one of Barry’s best romantic pieces. There is also the suspenseful music used in the desert sequences that, while featuring the synthesizer feel of the action scenes, still feels in place and reminds the listener of Barry’s classic suspense music. So how does The Living Daylights hold up? Quite well it turns out. 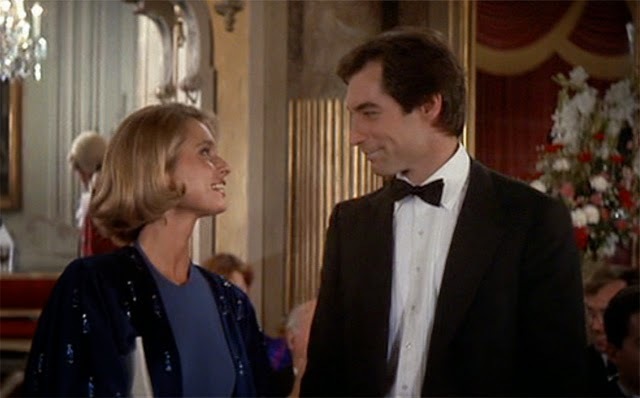 With Timothy Dalton’s grand debut performance as Bond, Maryam d'Abo as Kara, a good overall supporting cast, great action scenes, and a great score, the series had brought a new Bond successfully to the screen. Indeed, it’s surprising to consider that the same creative team went from a series low to strength in a single film, as this film wipes away the disaster of A View To A Kill. But more than that, they delivered the best Bond film in a decade.